The next-generation Stalker Sport 2 is the powerful, and easy to use baseball solution. Quickly and easily measure pitching and running speeds with (2) active speed windows. All 30 Major League Baseball teams use Stalker Baseball guns. In a class of their own, Stalker Baseball guns dramatically outperform other "toy radar" guns. Simple operation, certified accuracy, greater range, true pitch speeds, and consistent readings make Stalker Baseball guns stand alone. Built to last - just ask any baseball scout. Includes Stalker Sport 2 radar, (6) AA (non-rechargeable) Alkaline batteries and Operators Manual in cardboard carry box. Includes Stalker Sport 2 radar, (6) AA NiMH (rechargeable) batteries, Wall charger and Operators Manual in cardboard carry box. Includes Stalker Sport 2 radar, (6) AA NiMH (rechargeable) batteries, Wall charger and Operators Manual in hard carrying case. Stalker’s Sport 2 - the lightweight, accurate and powerful baseball solution. Following our success with previous Stalker Sport models, the Sport 2 includes updated and improved radar design, new modern components, and more accurate and sophisticated software algorithms. Displays speed in either units or tenths. Reduced size and weight improves comfort. Uses common AA NiMh rechargeable batteries or AA Alkaline (non-rechargeable) batteries. Battery Handle Cap quickly Snaps ON/OFF. In-Gun-Battery wall charger is included with Package #2. 2 Active Speed Windows – Both Peak Speed and Plate Speed. 3-Hour Battery Life – with low battery indication. Stopwatch function – Simultaneously measures pitches and times runners – optional stopwatch cable required. Two transmit modes – Pull-to-transmit; pull-on, pull-off. Recall Previous – Recalls previous 5 readings. Default settings are optimized for measuring pitch speeds - User presses the MENU key to customize the settings. Just how accurate is the new Sport 2, and how does it compare to the competition? Most radar guns advertise "accurate to within +/- 1 to 3 mph." 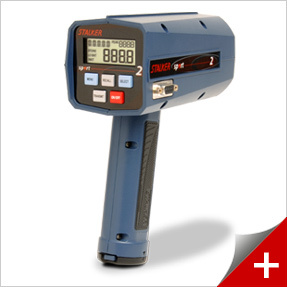 Stalker radar guns are typically accurate to within .1 (one-tenth) of a mile per hour (or km/h). After extensive testing we discovered that the Stalker Sport 2, and a ballistic chronograph agreed closely on nearly all measured speeds, but a competitor’s gun measured 1 to 3 mph higher on almost every pitch!